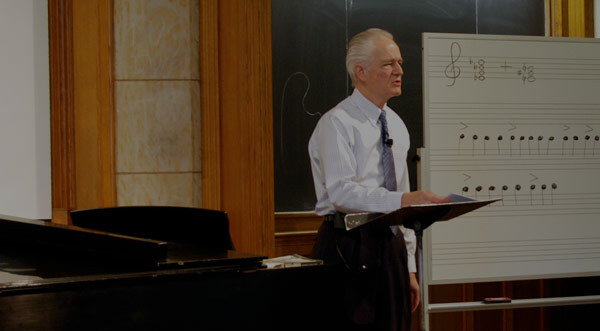 This lecture addresses the history of the modern piano and its music. Undertaking a detailed discussion of the different forms of the piano from the early eighteenth through twentieth centuries, Professor Wright also shows how the instrument evolved through a variety of photographs and paintings. He further supplements the lecture by playing recordings that were made on the pianos actually owned by such composers as Mozart and Beethoven. The lecture ends with a guest piano performance by Yale undergraduate Daniel Schlossberg, Jr. Guest Piano Performance by Daniel Schlossberg, Jr. Professor Craig Wright: Okay. So this morning what we’re going to be dealing with is the question of the development of the piano, really from the time of Mozart through Beethoven through Chopin and through Liszt up to the modern grand piano that you see in front of us and we’ll end with a guest performer. Dan Schlossberg will be coming in about 11 o’clock and we’ll be talking with Dan at that point. We start with Mozart because he was the first composer to switch from the harpsichord over to the piano. The harpsichord was the primary instrument, of course, of the Baroque period, as we said before, 1600 to 1750. Now our first slide that we see on the screen this morning is a Dutch harpsichord — comes in the Low Countries — of the seventeenth century. It’s actually in our own collection of historical musical instruments at 17 Hillhouse Avenue, and many of the slides that we’ll — we will be seeing today come from that particular collection. So if you ever happen to be sick and going over to DUH, right next to DUH on this side of the railroad tracks or the canal there is this splendid collection of keyboard instruments. You got a chance I believe in section last time to deal with the harpsichord, and perhaps even play the harpsichord, and you remember that it produces this kind of tinkling, jangling effect. Right? So if you ever hear a tingling, jangling keyboard instrument on a test, what are you going to say about musical style? What period does it come from? Daniel. Professor Craig Wright: Baroque. Okay, so that’s a good key. It’s one of the fingerprints for Baroque music. But young Mozart here about 1770-1780, he came to prefer the piano because what was the one limitation or a central limitation of the harpsichord? What was the problem, in essence, with the harpsichord? Nice and loud. Kristin, is it? I can hardly see back there. Kristin, nice and loud. Professor Craig Wright: No dynamics. Okay. Basically, you get one dynamic level. Yeah, you can throw some levers and maybe bring some more strings in but it’s cumbersome and you can’t shade a scale; you can’t reach for a climax. It’s not only dynamics. It’s shading that’s also very important there. So people began to switch over to this thing called the pianoforte. Originally, it was all one word, pianoforte, the loud-soft or the soft-loud, pianoforte, so that there could be gradations of sound. And this was an instrument invented in Florence around 1700.. Actually, we know the name of the person who did it, Bartolomeo Cristofori. I didn’t put that up on the board but that’s what happened in Florence around 1700, and it took about fifty years or so for this to catch on, this invention to catch on and gradually replace the harpsichord, but notice that when we have our first pianos that they look virtually identical to the harpsichord. Here is a harpsichord from our collection. Here is a piano of the sort that Mozart would have played about 1770. So it’s not that much bigger. Right? Go back and forth quickly, if you would, Jacob. There is the harpsichord and there’s the piano, and, as said, Mozart was the first significant composer to switch from the harpsichord to the piano. So let’s go on to two slides here. We’ve got a couple to skim and then here is Haydn. He’s composing, thinking things through at a keyboard. And here is Mozart working at a keyboard. But Mozart actually didn’t compose at a keyboard. What — why is he then seated at a keyboard? To show that he’s a musician. You need an icon to associate it with. When Mozart composed — do you know where he did most of his composing? Some of it at a billiard table, but most of it in bed. His sister tells us that and his wife tells us that. He would get up in the morning. He would just stay in bed and he had this kind of desk with ink trays and sand and stuff to blot the paper, and he would work in bed from about seven until ten in the morning. He didn’t need a piano. He heard it all in his head. In any event, in 1781 Mozart has had it with the “Archbooby” of Salzburg. He breaks free of him and establishes himself as a freelance musician in the city of Vienna. This was kind of a risky gambit — to be a freelance musician. We have two freelance musicians in our midst today, Santana and Jacob. How is it, Santana, being a freelance musician? Professor Craig Wright: Busy. What do you have to do? Professor Craig Wright: Run around to different gigs, right, trying to patch together a living as best you can until you work your way up to a more secure position. Same thing, I’m sure, with Jacob. Well, what did Mozart do when he got to Vienna then? How was he going to patch together a living? He did it through two ways. One, he was going to give piano lessons to the aristocracy and two, he was going to play the piano in public concerts — teacher, performer. And as a result of this, he perfected or contributed greatly to two important genres in the history of music, those genres being the piano sonata — we’ve talked about the sonata, usually three movements. Those he wrote mostly for his pupils. And then the piano concerto — Mozart wrote twenty-three original piano concertos — the piano concerto, which he wrote principally for himself as a kind of showpiece for public concerts. And you will be watching in section beginning this evening, a wonderful video of the performance of the great D Minor Piano Concerto of Mozart. Mozart’s piano concertos are much more difficult than his sonatas. He intended these piano concertos for he himself — no, for him himself? I guess so, for him, yeah — to play, and he did so, interestingly enough, at this public hall that was located in the casino in Vienna. Here’s a picture of that casino, which today is actually the — it’s this building to the right there, the tallest one. It’s a big building and it had a big public space in it and that’s where he performed. It still exists. That building still exists. It’s the Ambassador Hotel in downtown — in the Neuer Market Platz there in Vienna. Why did Mozart play in a casino? I was driving down the highway the other day and I saw a sign up there: Usher at Mohegan Sun. My wife thought this might be a Poe play, you know. But who is Usher? A rap artist? Do — he is a musician. Right? No? Who’s Usher? Come on, guys. Professor Craig Wright: Okay. Frederick, nice and loud, please. Professor Craig Wright: An R&B singer, but he’s playing the casinos because that’s where the money is. Okay? That’s where the money is. That’s where the crowd is; that’s where the money is. And Mozart was doing this back in the eighteenth century as well. The other venue that he played — I think I’ve got a slide of this; Jacob, let’s take a look at this — is the local Court Theater, the Burgtheater. It wasn’t that big. It was about the size of our own Sprague Hall here, Morse Recital Hall inside of Sprague Hall — seated about eighteen — excuse me, eight hundred people. And for this Mozart would have to hire the orchestra, he would have to compose the music, he would have to print the tickets, he would have to sell the tickets out of his own apartment, and he would have to transport his own piano over to this hall to provide the instrument for him to play. Let’s take a look at this piano of Mozart. So here is a piano of Mozart. It’s a very small instrument, as you can see. Its compass is only five octaves, F to F. So it — and it has only one string per key. If you go up to the modern grand and actually look at it, you’ll — you hit middle C. There are actually three strings up there that get struck by that hammer, but in Mozart’s piano there’d only be one. It’s much smaller in a number of different ways. Now let’s take a listen to it. Let’s listen to a performance on Mozart’s piano. And I emphasize here: this is not a replica of a piano that — of Mozart’s day. This is Mozart’s own piano. After he died it went to his widow who gave it to the eldest son and ultimately it came in — back into Salzburg and is today in the Wohnungshaus there in Salzburg. So this is the real piano and we’re going to hear a performance of the famous Sonata in C Major. So let’s listen to a little bit of Mozart’s own piano. [music playing] Second theme. [music playing] Let’s stop it there. Here’s what he wrote it for; here’s what it is sounding. [plays piano] Higher or lower? What do you think? How many say higher? Raise your right hand. How many say lower? Raise your left hand. Interesting. It’s actually lower, yeah. It’s down a half a step and that was typical. I think we talked about that before. The tuning kind of floated around up until really the twentieth century when it got — sort of got fixed that A should be 440 vibrations per second. So that’s Mozart’s own piano. What did you think about the sound of it? Any adjectives there? Somebody tell me something about the sound of Mozart’s piano. Play the beginning again if — are you still there on that one? Okay. Give me two adjectives about this sound. [music playing] Okay. Someone give me — shout out an adjective. Professor Craig Wright: Shallow. Okay. It doesn’t have a lot of resonance. It does not — It’s not a big, rich sound. So the sound dissipates very quickly because there are not a lot of resonators around that instrument. So we’ll take shallow. Give me another adjective. Roger. Professor Craig Wright: Pungent. Okay, kind of sharp — pungent you said? Professor Craig Wright: Punchy. Oh, I like that even better, punchy. Yes, and I put the word up there “staccato” as opposed to “legato.” Mozart’s piano does not lend itself to legato lines, these lines that are tied together. Think of your ligament. Right. It’s all etymologically related to the word “ligare,” I suppose. So, legato: smooth, connected. But that’s not the sound that we get in Mozart’s piano. We get this staccato, as Roger says, punchy sound so — and it’s because the hammers are actually made of leather, kind of hard leather, rather than felt. In the nineteenth century they put felt on these hammers and it kind of smooths it out a bit. It makes it less punchy. So those are a couple characteristics of Mozart’s piano. It tends to encourage fast, staccato playing. All right, 1791: Mozart dies. Beethoven had been originally sent to Vienna to study with Mozart, but then there were family problems. His mother died back in Bonn so he had to go back and look after the family. Beethoven, like Mozart, was a pianist, but unfortunately for Beethoven, his teacher was his father, a somewhat unscrupulous individual who tried to pass off the rather short Beethoven as being two years younger than he actually was. Why would he want to do that? Well, oftentimes you get kids — the cut-off in twelve-and-under soccer or USTA tennis you are supposed to — you can’t be sixteen before that particular date and people will try to sneak over on the other side of it. Well, because in terms of the music of Beethoven here, the father wanted the son to be the next Wunderkind, right, the next child prodigy, the next Mozart. Why? Because money was to be made in that fashion. The Mozart family had certainly made enough of it that way. But eventually Beethoven broke free of this tyrannical environment in Bonn and established himself permanently in Vienna. Think about it. Bonn is at the very west end of the German-speaking lands; Vienna is off toward the east end of the German-speaking land. So he went all the way to the other side of it but Vienna, of course, was the musical capital of the world at that particular point. So here is what Beethoven — young Beethoven looked like when he arrived in Vienna permanently about 1797. Oh, forget it. We’ll — I forgot that slide but it doesn’t matter. Let’s look at Beethoven here. Here is young Beethoven. And here is middle-aged Beethoven when he is writing things such as the Eighth Symphony that we heard at the JE concert. So we have Beethoven young, Beethoven middle-aged and Beethoven dead. Okay? That’s Beethoven’s death mask. The only reason I mentioned this is that it was drawn by Joseph Dannhauser who also was the artist who painted the cover of your textbook. We’ll come back to that just a little bit later. So when Beethoven — let’s — that’s too ghoulish. Let’s go back to Beethoven looking a little better there. I like that better. Don’t you? So with that vision of Beethoven on the screen, let’s make the point that when he arrived in Vienna he astonished the aristocracy by the power of his playing — the aggressive nature of it, the physicality of it, the virtuosity of it. It was much more technical than anything that Mozart had ever created on the piano, in part because gradually in this period the piano itself was getting bigger and more powerful. So here is — let’s move on now over dead Beethoven’s body here, and over to this piano, which again comes from our own collection of musical instruments. It’s a Konige piano of about — I think we know exactly — 1799 and it was made in Vienna two doors down the street from where that casino was. That’s where the Konige shop was in Vienna. So this is the kind of instrument that Beethoven would have played when he first arrived in Vienna. It’s a little bit bigger. It’s got a few more keys added to it. Then in 1817 Beethoven — well, let me — let’s move to the next slide. I want to show this to you just for a moment. This — does this look like something from the early nineteenth century, picture of Beethoven? Actually not. It was created in the 1920s, not 1820s but 1920s. It’s a fanciful representation of Beethoven and his musical study there with papers all around. You see the ear trumpets on either side; he is growing deaf. You see his bowl of coffee or porridge or whatever on the keyboard. I’m interested here particularly in the piano, because what do we have back there coming out of the piano? A lot of broken strings, okay, and that’s important because when he played he would frequently break strings. Here, let’s move on to the next slide. It’s also something of a fanciful representation of Beethoven’s room with the idea of the moonlight and the “Moonlight Sonata” behind it, but it contains as a piano an illustration of a Broadwood piano. In 1817, the [English] maker, [John] Broadwood, gave Beethoven a free instrument. Why would somebody do that? Aren’t these pianos expensive? Let’s go on to — I think I have a shot of another one. This is not fanciful. This is Beethoven’s actual instrument. It is preserved today. It was purchased after Beethoven’s death by Franz Liszt, the famous pianist, and taken to — ultimately to Budapest and you can go into — I did this two summers ago — you can go into the National Museum there in Budapest, and it’s actually in Pest, and see this particular instrument. So it still survives. And as you can see, it’s getting bigger and more powerful, but why would this maker — English maker Broadwood give Beethoven a free instrument? These are expensive. What? Nice and loud. Professor Craig Wright: Probably what? Professor Craig Wright: Publicity, yeah, a celebrity endorsement. Right? Why does Tiger Woods drive a Buick? Do you think he really wants to drive a Buick? Okay, but [laughs] nonetheless in TV commercials he’s seen driving a Buick — a celebrity endorsement, and we’ll be talking a little more about that. So this is Beethoven’s Broadwood here, 1817 still existing today. Let’s listen to a little bit of it. We can make recordings. Specialists are allowed to make recordings on it. So here is Beethoven instrument, just a little bit out of a piece of this period by Beethoven. [music playing] Okay. Maybe we’ll pause it there. So do you like that sound? Would you like to have that piano in your house? Maybe; maybe not. A lot of you are shaking your heads. It sounds slightly out of tune to me, and I think maybe the reason is that often with Beethoven’s piano there are two strings per note. It’s really hard to get two strings exactly in tune. One string is what it is. Three strings you get the kind of homogenization of sound. Two strings it’s a bit more difficult. I think it’s the same thing with singers, oddly, too. When you’re singing with two people, it’s a little more difficult to tune up. One or three it’s not an issue. So it does have this slightly out-of-tune sound to it, but nonetheless, that is Beethoven’s Broadwood piano. What did Beethoven write for the piano? Well, thirty-two piano sonatas and five piano concertos, the most famous of which, and I put this on your — remember I gave you the “Essential Beethoven” sheet a couple of weeks ago. The most important of these piano concertos is the so-called “Emperor Concerto.” So we have the “Emperor Quartet” by Haydn, the “Emperor Concerto” by Beethoven. So Beethoven wrote five piano concertos, thirty-two piano sonatas, and these piano sonatas were not so much like Mozart’s teaching pieces. These were virtuosic pieces for Beethoven himself to play. How well did he play them? Well, you would think that he would play them absolutely superbly but that — contemporaries commented that his playing was kind of messy. Here’s what one of them said: “His playing is not clean. He has much fire, but he pounds a bit too much. He overcomes diabolical difficulties but he does not do so neatly.” Maybe — possibly — why might Beethoven have trouble as a performer here in the- in early 1800s? What was Beethoven’s issue? Caroline. Student: He was going deaf. Professor Craig Wright: He was going deaf so if he pounded a bit too much perhaps it’s understandable, but here is the kind of sound perhaps — oh, lordy. Here’s the kind of sound that the commenter might have had in mind, Beethoven pounding. [plays piano] And I’m exaggerating a little bit to get across that idea. Two points I guess: one, what the piano could do for you, with these extreme dynamics, and two, perhaps Beethoven because of his growing deafness was pounding a bit too much. After Beethoven, pianos only continued to get larger and more powerful. Let’s take a look at some of these later instruments. We’re moving on now to a Graf piano. Graf was another maker who gave Beethoven an instrument. This comes — my own shot from the collection of historical musical instruments in Vienna itself. As time goes on here, what we find is that in order — as this instrument gets bigger and we want a bigger soundboard, that thing underneath — that’s the main resonator. Okay? We need a bigger soundboard and, as this thing gets bigger and we want to put more tension on these strings to really pound, so we don’t break them or they don’t come loose, we need some kind of iron support. So first they started putting pieces of iron and then ultimately an entire frame, a bed of iron, cast iron, underneath that thing for that soundboard to rest in. Then we need the — at the other end we need a pin block and that pin block has to be very secure because that’s where the pins that anchor the strings are going to be. Most of the problems — if you think you’ve got a deal on a piano sometime, check your pin block, because you probably don’t. It probably has cracks in it and then you go to tighten that thing, get your instrument tuned, the next day it’s back out of tune because that pin block is not holding. So you have to have a very secure pin block. You have to have a big resonator and in order for that to be helpful on — you need the cast iron frame underneath. All of these things allow for a bigger, more powerful instrument to be put into place. So this is a Graf, as I say, from the collection in Vienna. The range of the instrument is getting bigger; the sound of the instrument is getting bigger. Let’s go on to the next slide here. Here is young Franz Schubert about your age, young Franz Schubert writing the kinds of pieces that we used in the review section for example, and here is the piano that he was playing, also a Graf instrument in the Schubert Museum there in Vienna. The Graf instrument was also given not only to Schubert and to Beethoven but also to Franz Liszt. Let’s take a look at this, another Graf. Let’s move on to this. This, of course, is what? Where have you seen this before? Cover of the textbook. What is this? This is a marketing tool. Did these people that included Georges Sand, Alexander Dumas père, Victor Hugo, Rossini, Paganini — did they ever come together and pose for this? No. They were in completely different cities. This is a marketing — I was looking at a Brooks Brothers thing that seemed to be shot in Princeton, but if you look carefully it had all of these brown leaves on the thing and the people had been patched in there and the trees around the thing they were all in bloom. This is a hodgepodge. Well, this is a hodgepodge too, but it’s kind of an interesting one because it tells us a little bit about what the nineteenth century thought of Beethoven. Let’s go to this last slide here. So here’s Franz Liszt, the famous Franz Liszt, playing the piano. He has the historian Marie d’Agoult; his paramour at his knees there in a typical nineteenth-century supplicatory position for women. And up at the top, who do we have? The bust of Beethoven at an Olympian height looking down over the proceedings, blessing Liszt and most importantly, blessing the Graf piano. Well, Liszt did play a Graf piano. Let’s listen to — and we’re going to have a slide here of Franz Liszt. Let’s go on to the next slide. Oh, no. Well, there’s one other composer I should mention that’s a wonderful composer. I don’t have time to do anything really with him in this course, but he’s one of my favorite, Fredric Chopin. Here’s Chopin playing a Pleyel piano. And we have over with our collection a Pleyel right — not his piano but right from the period that he was playing. And let’s go on now. It should be the portrait of — I got them out of order. All right. Let’s go on to the portrait of Liszt here, portrait of Liszt. Here is Franz Liszt. And let’s go back one now and here is an Erard piano that Liszt played. He actually — it’s actually in the collection of Buckingham Palace, but when Liszt went there and played for the queen — for Queen Victoria he played on this particular Erard instrument. So it looks very much like a modern instrument. Let’s hear just a little bit of Liszt’s music. You have it as CD four, track one. It’s a “Transcendental Etude,” a sort of hugely difficult technical study by Franz Liszt. Let’s listen to just a bit of Liszt playing. [music playing] Okay. We’ll stop it there. So this is called a study. There’s some irony here. It’s called a study in order — you play this piece and you get better. Okay? Now how good would you have to be to begin with to play this piece? Holy schmoly. This is really difficult technically. Dan, have you ever played a Liszt transcendental etude? Oh, he has. Well, we should have gotten him to play a Liszt transcendental etude. It’s kind of the top of the line. My guess is that in Liszt’s day there probably were six or seven people in all of Europe that could actually play these studies that were designed to get you to be a more proficient pianist. We were kind of out of the game before the game even began in an odd way. So this is Liszt’s Erard piano. I want to show just a couple more slides and then we’ll introduce our guest. And we’ve seen the portrait of Liszt. I was struck when — at the Liszt Museum in Budapest that when you walk in there and you see that Liszt played in his home — and there it is. It’s a big instrument with two pedals down there. It’s a Chickering instrument and you know where that instrument was made? In Boston. So Boston was a major — and New York also here in the 1860s-1870s a major manufacturing center [for pianos], and they shipped one all the way to Budapest for Liszt to play. And a fine, fine piano indeed. A couple more and then we’re going to stop. And of course when Liszt died they were particularly — not so much interested in doing a death mask of his face but one of his hand, because he was thought to have a very unusual sort of webbing between his fingers that allowed him to stretch in ways that other pianists couldn’t. A few more and then, as I say, we’ll stop. This is an interesting piano. Liszt’s son-in-law was Richard Wagner. You can read about — all about this in the textbook. Liszt’s son-in-law was Richard Wagner and Wagner composed at the piano. Mozart generally didn’t, but Wagner did, and this is the instrument that was involved at the end portion of the composing of his opera Tristan. And we heard parts of Tristan. Right? We heard the Liebestod out of Tristan so it may have been on this very instrument that Wagner composed part of that music. Where is this instrument today? Right down the street. It’s in that same collection of historical musical instruments. This is what we call the Wagner piano over there on Hillhouse Avenue. So pop in someday to 17 Hillhouse Avenue. Go up to the second floor and you can see all these historic instruments. It’s the greatest collection of keyboard instruments in the entire Western hemisphere, right here, and it’s virtually unknown. So that’s Wagner’s piano. What’s of interest is see how those lines are going straight out to the back. They’re simply braces helping the soundboard there, and the strings are running at right angles to the line of the keyboard. But things didn’t stay that way, interestingly enough, because as time went on, there was a German manufacturer — this is actually a Bechstein — there was another German manufacturer, however, with the name of Steinweg who immigrated to the United States and set up in New York City, and of course that Steinweg became what? Steinway. Steinway piano manufacturers of New York City. And they instituted a couple of changes. But most importantly they instituted this idea of cross-stringing where instead of having the bass strings run out in a straight line they took them and run them up over. And next time you’re at a grand piano — maybe come up afterwards today — to look at the bass strings. They run up over the other strings. What this gives is a much more homogenous kind of sound. It’s a much more homophonic instrument. Ironically, the Wagner piano, when you play it, is very clear. You don’t get this kind of wash of sounds, because the strings are, as you can see, a little bit more separated. And here — this may be our last slide — is what we end up with at the piano, a sort of gilded Steinway from the gilded age. This is actually up in the Clark Museum in Williamstown, Massachusetts, but it is a Steinway piano, and you can see on it three pedals and this is my last point. Initially, all the panels up into the Steinway there you saw just two pedals underneath, and these are the two we’re going to talk about today. The right-most pedal is called the sustaining pedal. [plays piano] Play that and the sound goes away because there are dampers. There are pieces of felt up on top of the string, [plays piano] but I can lift all those pieces of felt, those dampers, just by pushing that pedal down, and then I get [plays piano] so the dampers are now up. So we call this the sustaining pedal or the damper pedal, sustaining pedal more often. [plays piano] And the other one is the one all the way to the left. You can — what’s happening here? A.J., look at the keyboard here if you will. What’s happening? Can you see what’s happening to the keyboard as I push that left pedal? Chris, Daniel. Professor Craig Wright: Yeah, it’s wiggling. It’s going this way. What’s happening is these groups — units of three strings are all sliding so that when you hit the- [plays piano] that way you’re — now instead of hitting three strings [plays piano] you’re hitting only two strings. It makes the sound softer by shifting the whole keyboard and hammer mechanism so only two strings are engaged instead of three and that makes the sound a lot more quiet. All right. That does it for the specifics of today. Let’s introduce our guest. So Dan, come on up, please. Daniel Schlossberg Jr., Yale College. What college? Is it Pierson, Daniel? Yeah, he’s in Pierson. How many of you know Daniel? Professor Craig Wright: Branford. Oh, sorry. I’m sorry. That’s right. I guess that was in Branford. I heard a recital of him in Branford. So Dan is a junior now. He’s a music major. I — right? You’re a music major. Any double majors or anything like that? You just — no. Okay. Sometimes, you know — Kensho’s out there doing microbiology and music, but Dan is also a composer. Right? Dan does a lot of composing so he’s really into music in a serious — do you do any conducting, Dan? Daniel Schlossberg: A little bit. Professor Craig Wright: A little bit of conducting, and maybe at the end of the semester it’d be fun when we get to modern music to have — do a piece by Dan, bring in a piece by Dan and we could have him come back as guest composer. So how long have you been playing piano? Professor Craig Wright: All right. Okay. First grade, six, seven, something like that. Are your parents musical? Daniel Schlossberg: Not at all. Professor Craig Wright: Not at all. Professor Craig Wright: Well, that’s kind of musical. Right, but they’re — so they’re not professional musicians. And any relatives in music at all? Daniel Schlossberg: No. Not really. Professor Craig Wright: Not really. So — and I hate to embarrass people, but this is something that fascinates me — your ear. I — it’s — I always think you — it’s — you got to have a really good ear to be able to do what you do. How good is your ear? Daniel Schlossberg: Well, in terms of what? Perfect pitch or absolute pitch? Professor Craig Wright: Presumably you don’t have absolute pitch. Professor Craig Wright: Okay. So if we played something for you and told you what the first note is, you would get the notes thereafter. Daniel Schlossberg: Actually, I think if you just played a note I could also identify it — on the piano, definitely. Professor Craig Wright: Oh, really. How interesting. So you do have absolute pitch for — and I think this is true — that some brains are wired for absolute pitch with particular instruments. I get pretty close on the trumpet because when I was in the fourth grade I had to play in a band kind of thing, play the trumpet. So if at a young age you get locked into some instruments, those particular pitches can stick with you. That’s interesting. So almost absolute pitch here. So that’s one thing I wanted to ask you about. Because if you have a sense of pitch and if you hear — if you know that in playing a piece if I go out there — what happens when somebody plays a piece of music? Lots of things are going on. Why do I, Craig, have memory lapses, when Dan probably doesn’t have memory lapses? Because he probably has a better ear, he can remember this more, he can stream it out there, and he knows — he hears that inside of his head [singing] and he knows, “oh, that’s probably an A and if I want that sound I know to go to that particular spot.” I’m not sure what the sound is in my head and I sure don’t know quickly, instantaneously, where that thing is, and this stuff is going by blazingly fast so your mind’s got to be wired for it to begin with. I think it — it’s a huge benefit to have a really good ear even if you are a pianist. Another question: Do you ever get nervous when you play, Dan? Daniel Schlossberg: Yes. All the time. Professor Craig Wright: All the time. Well, think about that, nerves and performers. Jacob, do you ever get nervous when you play? Professor Craig Wright: Do you take drugs, Jacob, [laughter] [laughs] recreationally, pharmacologically? [laughs] Actually, musicians — has anybody ever heard of this? Musicians do take drugs for this, beta-blockers to kind of relax them, to lower their heart rate, French horn players — I have a friend who is a professional French horn player — just to kind of get you to settle a little bit, because if you play these instruments, and it’s just a question of a fraction of an inch and you’re like this, my God, a string player, it’s a catastrophe, and then things start going downhill. [laughs] So these are the kinds of mind games I think that performers have to engage. So do you take lessons here, Dan, at the School of Music? Are you studying with anybody there? Dan Schlossberg: With Wei-Yi Yang. Professor Craig Wright: Okay. He is one of the artist teachers over at the School of Music. Do you get any time to practice? This is a busy place. Professor Craig Wright: Hardly — no time to practice. That’s the great dilemma for Yale — really good performers at Yale. There’s just no time to practice. What do you want to do — what do you think you want to do with this music business? Professor Craig Wright: Mm-hm. So how are you going to connect the dots? How are you going to get from Dan here, point A, to Dan here ten years from now? How do you plan to do that? Dan Schlossberg: Ten minutes, the whole piece. Dan Schlossberg: It’s so condensed that you really have to invest everything in each note. With some Beethoven, it’s so long that you have to think a lot more in terms of a broader scale but in this case there’s a prelude and the musical idea is so condensed that you really have to focus hard and make appropriate contrasts quickly, etc. Professor Craig Wright: Okay. [laughs] Yeah, well, we have another one. In other words, this is not a dazzler. We’ve saved a bit of a dazzler for the end of this ‘cause I did want to show you how well this young man plays. So let’s just listen to the Beethoven then. Do you want to do — I beg your pardon. Okay, a wonderful piece. Again Beethoven’s sort of pulling in just a bit there, and a wonderful performance.